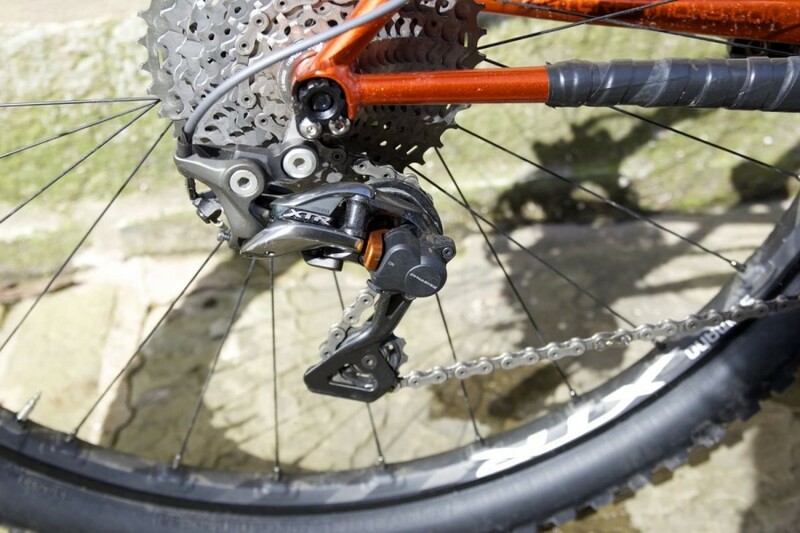 For 2015, Shimano pulled out all the stops for its flagship groupset, and potentially provided an answer to the challenge presented by SRAM’s 1×11 takeover. That’s not to say that the challenge has been met head on, though. 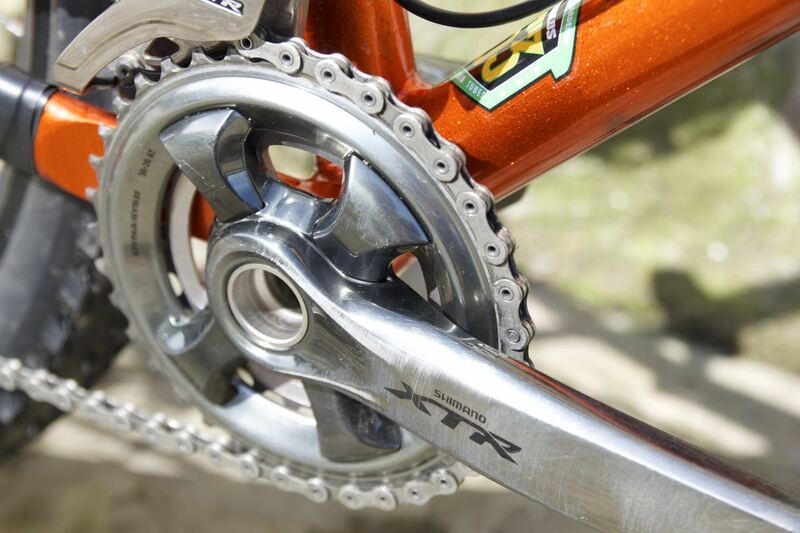 While XTR provides a one-by option to those who want it, the meat and potatoes of the new 2015 XTR is provided by a front mech shifting across more than one chainring, with a 40-11T, 11-speed cassette. 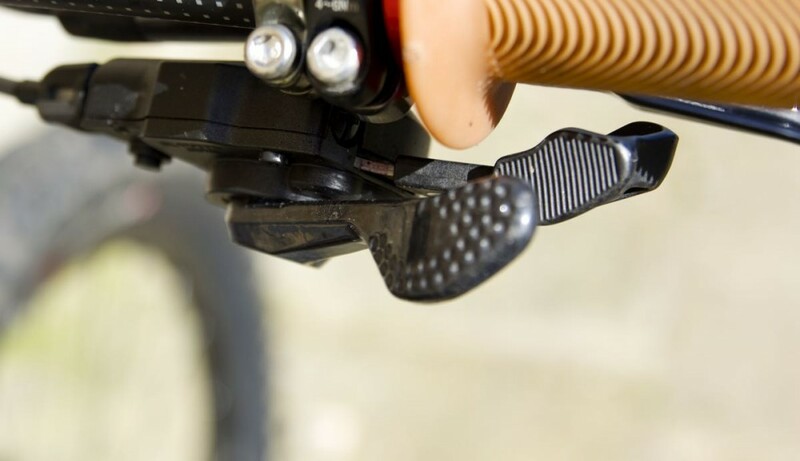 It’s available in both ‘Race’ and ‘Trail’ configurations with slightly different weighs and adjustment capabilities, but the only differences are in the pedals, the chainset and the brakes. 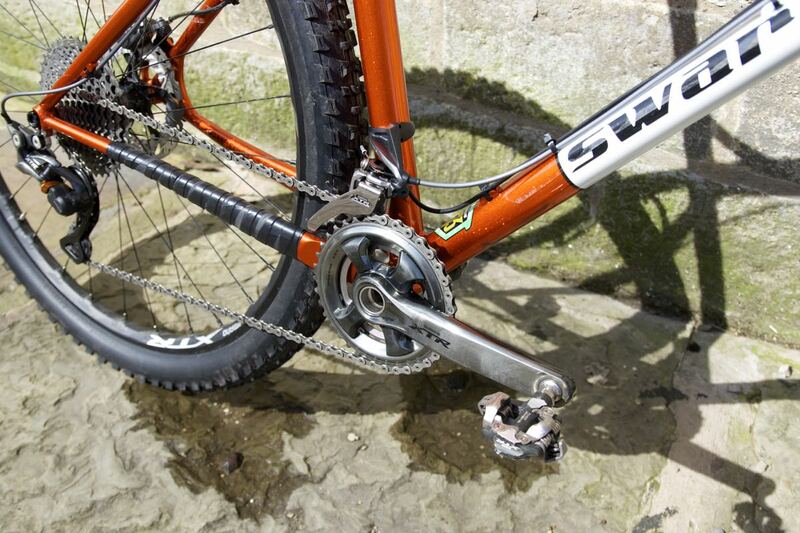 Here we’ll take a look at the drivetrain. The flagship component of the flagship groupset is probably the chainset. It’s the largest single piece, and it’s therefore the most obvious. 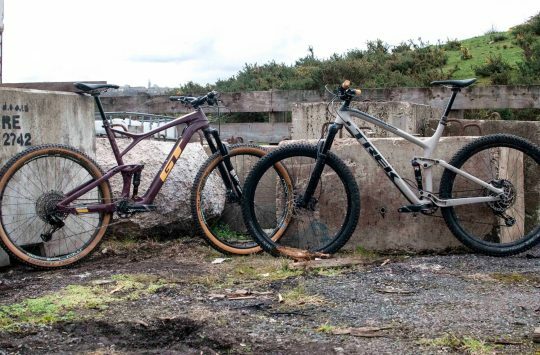 It’s fair to say that it is a striking – but rather polarising – piece of kit on its own; half the office hated the look of it, and the other half were waiting for it to grow on them. The XTR Race double chainset we’ve tested has a 36T outer chaining made from a carbon/Ti combo, and a 26T inner made from aluminium. They attach to the cranks from the back and there are four neat blanking plates to keep things tidy at the front. The crank arms are lavishly polished, and use the traditional HT2 aluminium spindle to attach to each other through the bottom bracket. 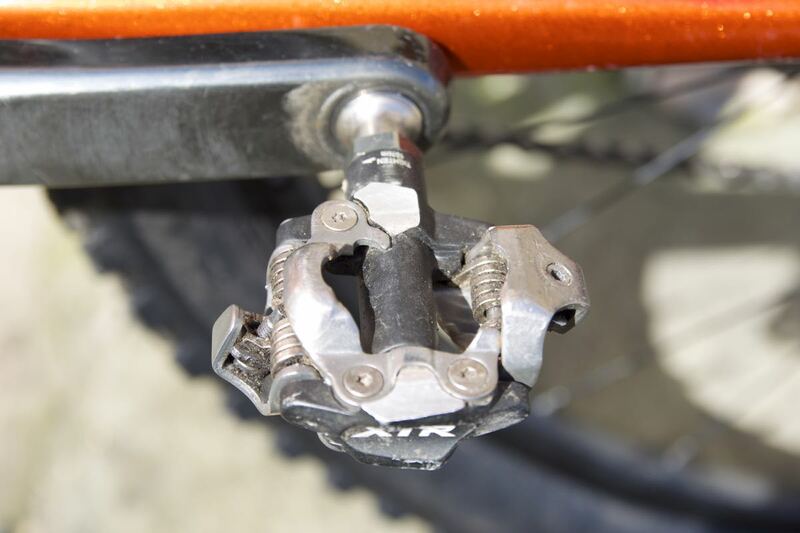 The crank axle is the same diameter as other Shimano offerings, but the bottom bracket bearings themselves have a smaller external diameter, presumably to save weight. This is the Race chainset, so it’s a bit lighter, with a ‘3D hollow bonded structure’ on the non-drive side crank. It’s bit narrower than the Trail version – and unlike the Trail it can’t run a triple; you’re stuck with a maximum of two rings only. The cassette is a thing of beauty, ranging from 11 to 40 elegantly formed teeth, apparently minimising the jump between sprockets. 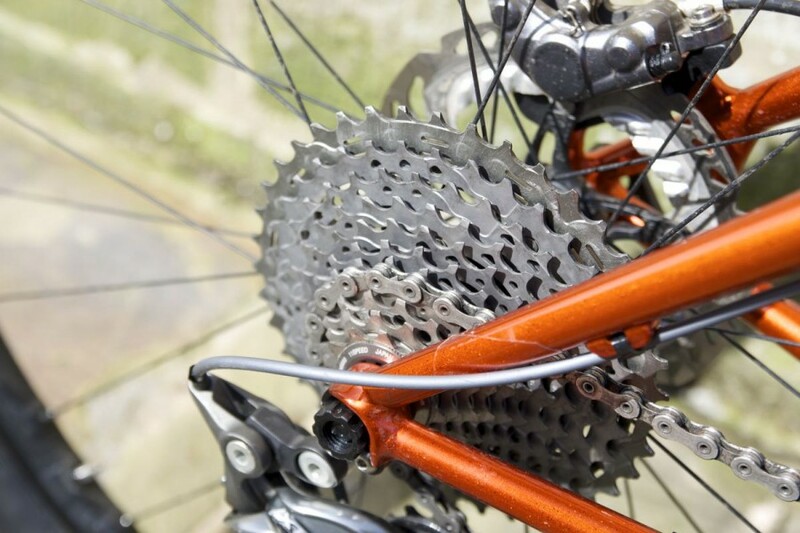 The largest sprocket is aluminium, the next ones are titanium, and the smallest few are longer-lasting steel. There are a variety of carbon and aluminium spiders to keep things light and strong. 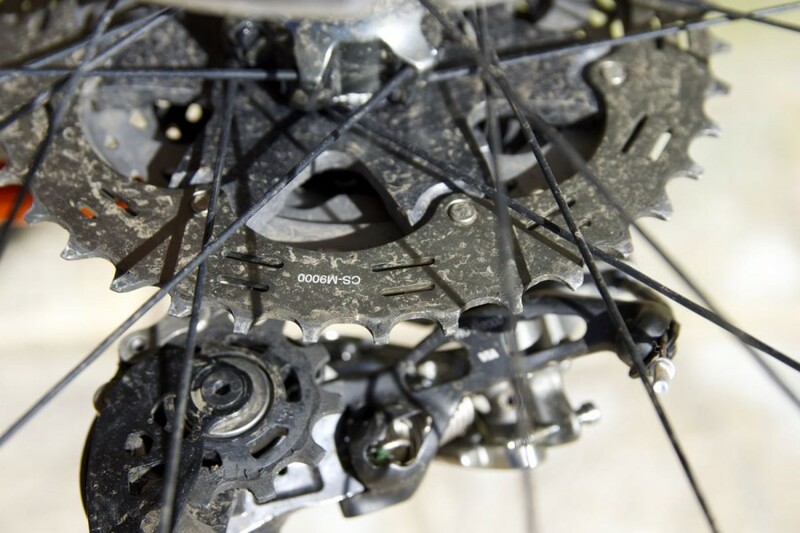 Cleverly, the cassette negates the need for a new freehub – it uses the same one Shimano has used for donkey’s years, by riding up the spoke side and following the dish of the wheel. Happily then, upgrading to 11 speeds doesn’t necessarily mean a new wheel. You can’t fit it to road wheels though, as the lesser dish caused by narrower hubs isn’t deep enough to accommodate the extended cassette. The ‘Sil-Tec’ treated chain – the same one as used on Shimano’s flagship road DuraAce groupset – is hauled up and down the cassette by a pair of very pretty derailleurs. The rear mech looks relatively conventional (if rather sculpted and elegant), but it’s had loads of tweaks compared to its predecessor. The parallelogram angles have been adjusted to accommodate the larger cassette, you can run a direct mount if you like, and the (slightly flimsy feeling) bronze-coloured clutch lever is now tucked out of the way – on some bikes the previous iteration would bang on the chainstay. Although I had no problems with tension on the standard setting, you can adjust the strength of the clutch with a hex key should you need to. The front mech, though, has been radically redesigned. A horizontal pivoting action and front cable entry make for a radical aesthetic overhaul for starters – one which apparently makes lever throw 30% more efficient. That front loading cable comes with some routing issues – but if you haven’t got any down-tube routing on your frame, you can get a much more conventional-looking top-swing mech to fit instead. The mechs are pulled about with some very tidy textured carbon levers on the shifters, which are slightly longer to mimic the throw on Shimano’s Saint levers. There are ball-bearings in important places for smoothness and longevity, skinny lever clamps for weight saving, and the shifters are very discreet. Once everything was installed and fettled (the typical Shimano piece of cake), it was time to ride. The first thing to say, once I’d clicked into the (slightly redesigned, but largely identical to last year’s) pedals, is that I didn’t notice the narrower cranks at all. That narrow Q-factor (158mm) is supposed to increase pedalling efficiency. 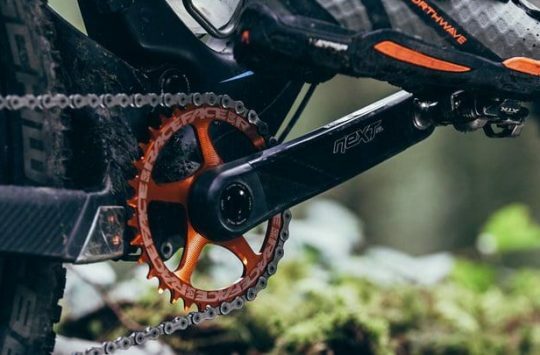 The very similar-looking Trail crankset has a more conventional 168mm Q-factor and has the added benefit of being able to run triple chainrings if you want to. I’m somewhat baffled as to why the arrangement is this way round, however. 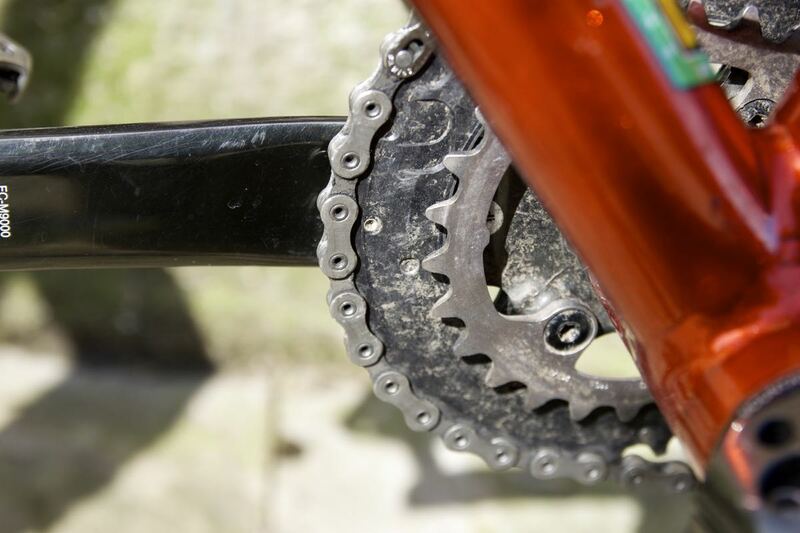 I appreciate that the narrower arms preclude the ability to run a triple, but surely racers would appreciate the larger chainrings more than trail riders? The largest one they can fit to this Race chainset is a 38/28T pairing. Unfortunately I managed to scuff the cranks after one (wintery) ride; the finish doesn’t seem to last very long around here, and I don’t particularly ride heels-in. While I can (and do) scuff cranks on a fairly regular basis, it generally takes more than one ride for the effects to be noticeable. Shifting was as exemplary as one would expect; a firm thumb press at either end was met with some reassuringly light-yet-solid resistance, and immediate action at the chain. Shifting down is possible with both finger and thumb – although perplexingly you can shift two gears down with your thumb by pushing through the first click, but only one gear with your finger. I say this is perplexing as (purportedly inferior) XT enables two shifts down with both finger and thumb; it’s hard to see why this has been dropped, unless it’s in pursuit of weight-loss. Personally, I use my finger to shift down if I’m out of the saddle and pushing hard, and I’d have liked the option of two shifts; this feels like a bit of a step back. The only other issue I noticed was a slight tendency for the cassette to graunch and grind under power when in the titanium cassette cogs. This seems to have cleared up over time, however, and I’m not the most fastidious at cleaning. 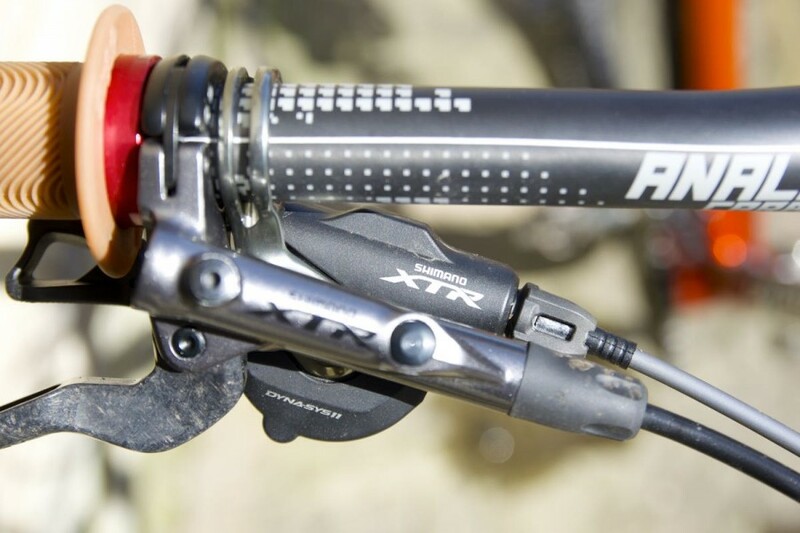 As is often the case with flagship products like this, it’s hard to see a mass market for the new XTR. True, it’s considerably lighter than XT, the next tier down. It certainly contains more carbon and titanium. It’s more technologically advanced, and it’s rather more expensive. But if you just want stuff to work, arguably XT (especially the recently-announced 2016 kit) has equivalent (or arguably better) functionality from a shifting point of view, at the expense of weight. 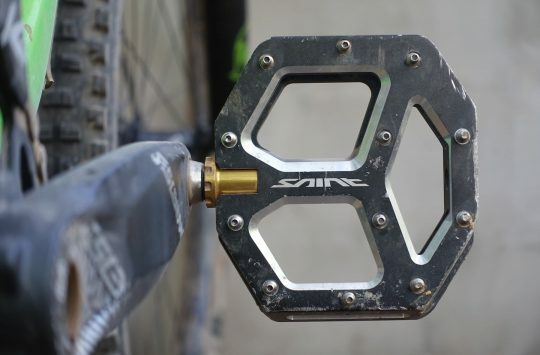 As to whether the challenge of SRAM’s 1×11 technology has been met? 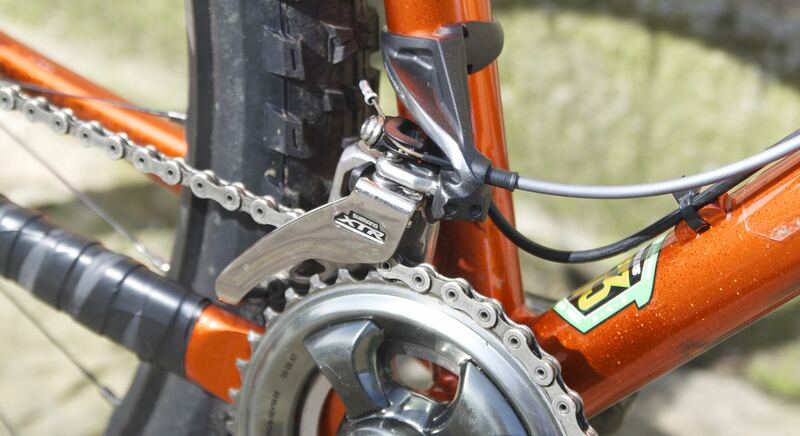 Well, Shimano is still putting faith in the front derailleur, as well it might; it works superbly. The shifting at the back is as good as ever, and (that minor grinding gripe aside) overall performance is excellent. I’m not convinced that the aesthetics have been improved, and the crank scuffing is a disappointment, but as a cocktail of light weight and flat-out 11-speed performance, Shimano has a worthy contender. I found it annoying that they changed the ispec again, and didn’t make it backwards compatible, It would have been easy to have made an ispec b option, hopefully someone will come out with a problem solver soon. MSP – the 11 spd XT version comes in I-spec II, band on and I-spec B options.